Listed below are my 2016 IDP Rookie Rankings. I will periodically update these throughout the off-season to reflect changes in free agency, defensive schemes, playing time, draft selections, etc. However, keep in mind that the information listed here is just a small sample of a much larger set of rankings and descriptions that are accessible through purchasing my 2016 Fantasy Football Draft Guide. 1. ILB Myles Jack (JAX) - Jack was one of the most accomplished linebackers coming into the 2016 draft and may have been a top five selection if not for a degenerative knee condition that may eventually require micro fracture surgery. Although he projects as an elite fantasy linebacker, we’re not likely to see his true potential until 2017 as Jacksonville already has two established, every down linebackers in Paul Posluszny and Telvin Smith. He’ll begin 2016 as a base-only strong side linebacker but could push himself into Paul Posluszny’s role later in the year with a strong early season showing. 2. DE Joey Bosa (SD) - Bosa, the first defensive player taken in this year’s draft, will play as a one-gapping, five-technique in the Chargers’ 3-4 defensive scheme. He’s slightly undersized for that role but is expected to add weight during the preseason to help ease the transition. Bosa’s strength at the point of attack makes him a stout run defender and he was still able to bring consistent pass-rushing pressure in college despite not having elite speed off the edge. He has 40 solo tackle/7-8 sack upside but it’s not likely he reaches those numbers in his first NFL season. 3. ILB Darron Lee (NYJ) - The Jets used a mid-first round pick on Lee and he figures to have the edge on incumbent Erin Henderson for starter snaps. He may not begin the year as an every down player but the Jets have generally kept both inside linebackers on the field in subpackages, so that responsibility may come sooner rather than later. Defensive coordinator Todd Bowles’ scheme has a history of creating linebackers who produce gaudy stats and Lee could be the next in line there if he cleans up a few areas of his game. 4. OLB Jaylon Smith (DAL) - Before tearing both his ACL and MCL in this year's Fiesta Bowl, Smith was a consensus can't miss elite prospect and arguably the best defensive player in the draft. When healthy, he has very few flaws in his game and has drawn comparisons ranging from Patrick Willis to Jamie Collins. He's a superb coverage linebacker who also received top grades in pass rush and has the sideline-to-sideline speed to be a tackle monger in the run game. Given the severity of his injury, his recovery figures to be a long and challenging one with him unlikely to see any field action until 2017. If he can successfully work his way back to at least near-full health, Smith projects to be a perennial All-Pro weak side linebacker and fantasy stud. For dynasty owners with good depth at the position who are willing to take a risk, Smith makes for a nice luxury pick as a player who could be an elite fantasy contributor in a year or two. 5. ILB Deion Jones (ATL) - Jones didn’t start a game at LSU until the beginning of his senior year, but led the team in tackles during that season with 100. He’s an athletic, rangy linebacker who possesses above average speed (4.38 40-yd dash) and coverage skills. The Falcons have been looking for an upgrade at all three linebacker positions, so Jones is well set up to be the week 1 starter at either middle or weak side linebacker. Given the lofty defensive stats a run-of-the-mill talent like Paul Worrilow produced during his time as a starter, Jones is a legitimate candidate to lead all rookie linebackers in tackles this season. 6. S Karl Joseph (OAK) - Joseph, the 14th overall selection in the draft, was regarded by many as the top safety in this draft class for his unique mix of ball-hawking skills and physical run-stopping ability. He tore his ACL four games into his senior season but has professed that he will be healthy in time for training camp in late July. The Raiders have produced above average fantasy safeties in recent years, so Joseph has a legitimate shot at being the top scoring, first year fantasy defensive back. 7. DT DeForest Buckner (SF) - Buckner was the third defensive player taken in this year's draft and projects as an immediate starter on San Francisco's defensive line. His size/power combination makes him a formidable force against the run and he should put up above average numbers in those areas early on. He'll likely need time to polish his pass-rushing skills however and isn’t likely to surpass five sacks in year one. 8. S Keanu Neal (ATL) - The Falcons selection of Neal with the 17th overall pick was seen as a reach by some draft pundits as he was widely viewed as a second round talent. It’s reported that Atlanta Head Coach Dan Quinn pushed hard to obtain him to fulfill the “Kam Chancellor role” within his defensive scheme. In college, Neal was a punishing tackler who did his best work as in in-the-box safety but often struggled to tackle and cover in space. He should see a strong amount of tackle opportunity behind a rebuilt linebacking crew and is the presumptive favorite to lead all rookie defensive backs in total tackles. 9. DE Noah Spence (TB) - Spence was perhaps the top edge rusher in this year's draft. He joins one of the deeper defensive fronts in the league though, so he will have to earn his playing time. He'll likely start the season as a third down, pass-rushing end behind William Gholston. If he progresses well enough, he could snag that starting role by the end of his rookie season and be one of the more sought after sophomore fantasy players heading into 2017. 10. DT Sheldon Rankins (NO) - Former Louisville Cardinal Sheldon Rankins was one of the of the most polished and NFL-ready defensive linemen in this year's draft class. His versatility will allow New Orleans to play him at various positions along the front line but he should see the majority of snaps as a one-gapping, undertackle. The Saints have eliminated two-gap principles from their defensive playbook which should help improve the defensive line fantasy production. However, Rankins is likely going to miss 6-8 games due to injury so he doesn't possess a ton of redraft value. 11. ILB Reggie Ragland (BUF) - Ragland was an impressive between the tackles linebacker at Alabama who was the 2015 SEC Defensive Player of the Year. His downhill, physical playing style appealed to the Bills who traded up eight spots in the second round to grab him (giving up two fourth round picks in the process). Before going down with a season-ending ACL injury, Ragland was slated to start and potentially play every down. The injury occurred early enough in training camp that Ragland should have no issue being ready for the 2017 season where he will be one of the top sophomore linebackers. 12. CB Jalen Ramsey (JAX) - Ramsey is arguably one of the better cover corners to come out of the draft in recent memory. He will be an immediate starter for Jacksonville at outside cornerback opposite Davon House. Although he already has a reputation as a shutdown corner coming out of college, expect teams to throw at him regularly to begin the season. This should translate to decent initial production but his fantasy numbers could suffer down the road if he lives up to the hype and teams start avoiding him. Like what you've read so far? Looking to dominate your 2016 Fantasy Football draft(s)? 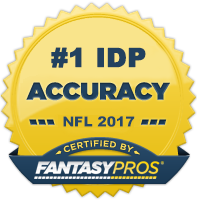 For $5.99 you can get complete access to The IDP Guru's comprehensive and exhaustive 2016 IDP Fantasy Football Draft Guide.